A Mysterious Giant 'Like' Statue Destroyed for the Launch of the Newborn #BMWX2: The Car That Breaks Every Convention. 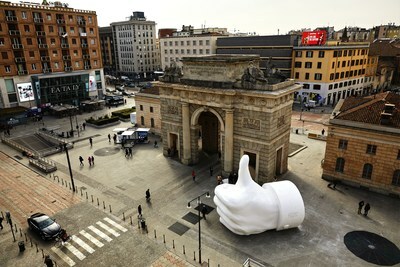 A M&C SAATCHI MILAN IDEA. 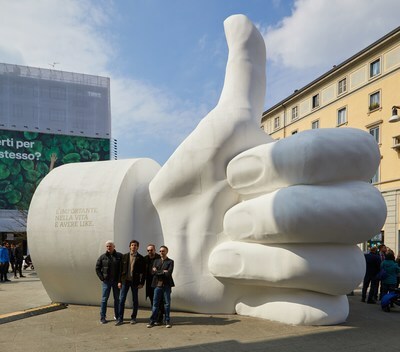 MILAN, March 27, 2018 /PRNewswire/ -- A giant, sculpted thumbs-up appeared on Saturday in Milan, in the heart of one of the most iconic city areas, Corso Como, famous for clubbing and for style. A thumbs-up that was an unmistakable reference to the Like icon, and an evolution of a famous and controversial middle-finger statue a couple of blocks away. Nobody knew where it came from or who the author was, but the message was clear. An inscription on top of the sculpture declares: "The only thing that matters in life is getting likes". The statue did not go unnoticed and unleashed a huge amount of curiosity in the people passing by and they took thousands and thousands of unforgettable pictures. As predicted a huge debate followed on social media where even some local personalities didn't miss the chance to express their point of view on the provocative message. Shortly photos of the statue went throughout the web, getting full press coverage on national news. Eventually, the statue became a MEME, turning the hashtag #LikeGigante into a national trend topic. 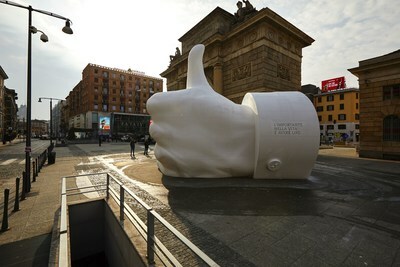 The conversation took place not only on digital channels: pedestrians were invited to express their opinion using an interactive board located in front of the hand giving either a thumbs-up or a thumbs-down to the message. The debate lasted two days until the thumbs-down voters won so provoking the destruction of the statue on Sunday afternoon. And it was not any ordinary demolition: the sound of a siren spread through the square, and to a climax of music, smoke and special effects a squad clad in black broke out of the statue in Trojan Horse style. Finally the mystery was unveiled. Inside the ruins we discover the new-born BMW X2 while a graffiti writer covers the original message by spraying a new one: "BMW X2. Break out of your conventions". The stunt was created by M&C SAATCHI Milan for the launch of the latest BMW model, the BMW X2. A completely new car designed to change the rules of its segment, and dedicated to those who want to break out of the new pre-defined social convention of getting approval by desperately searching for Likes.